We are far enough into the 2014 season to get a good feel between Gregg Berhalter's Columbus Crew and Robert Warzycha's. While I'm noticing plenty of differences, not many stand out as differently as passing statistics. Just about any fan that has watched the Crew for the past few years can tell you the team passes and posses the ball more. This also leads to said fan to say the team is more enjoyable to watch. While the overall trend in the world is to do such things, it is still a part of the game that hasn't quite made it to MLS save for a handful of teams (Crew being one that is trying). Passing can tell you a lot about the way a team plays. How many is usually a quick and easy way to know what a team likes to do. If you dig a little deeper you can find out where the passes are coming from and to what degree of success they happen. 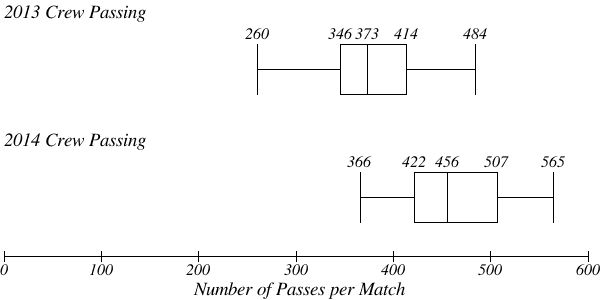 Drilling down on passing is not what I'm doing here today, just taking a look at how the volume of passes has changed verses last year. I knew there was a difference, but had not idea it was this much. So, it gets a mini post were I get to play with charts and learn how to post them. Here is passing totals by round vs last year.